Operation Tiderace commenced when Mountbatten ordered Allied troops to set sail from Trincomalee and Rangoon on 31 August for Singapore. The fleet was not armed with offensive weapons as Mountbatten had good reason to believe that the Japanese in Malaya and Singapore would surrender without a fight: on 20 August General Itagaki Seishiro, the commander in Singapore, had signalled Mountbatten that he would abide by his emperor's decision and was ready to receive instructions for the Japanese surrender of Singapore. Japan's defeat in World War II had caught the Japanese Command in Singapore by surprise. Many were unwilling to surrender and had vowed to fight to the death. 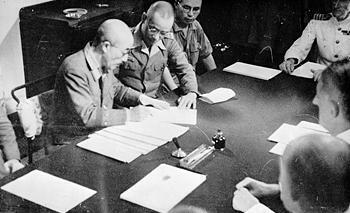 Itagaki had initially baulked at the order to surrender and instead ordered the 25th Army (the component of the 7th Area Army defending Singapore) to resist when the Allies arrived. There was even a secret plan to massacre all Allied PoWs on the island. However, three days after the emperor's announcement on 15 August, Itagaki flew from Singapore to Saigon to confer with his leader Field Marshal Count Terauchi, Commander of the Japanese Southern Army and all forces in South-east Asia. Terauchi prevailed over Itagaki who then sent his signal to Mountbatten. Newspapers in Singapore were finally allowed to carry the text of the emperor's speech, confirming what many already knew from listening to All India Radio broadcasts from Delhi on forbidden shortwave radios. 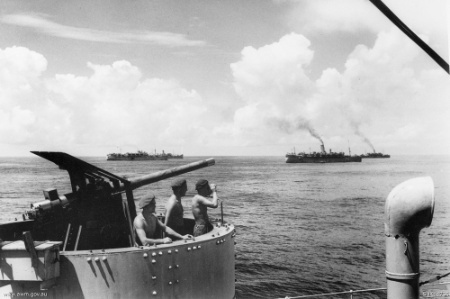 The Allies arrived in Malaya on 28 August with a small portion of the fleet sent to Penang as part of Operation Zipper. When Penang surrendered without resistance, the fleet sailed for Singapore on 2 September, passing the Raffles Lighthouse at the Southern entrance to the Straits of Malacca. The fleet arrived in Singapore on 4 September 1945, meeting no opposition. However, the French battleship Richelieu struck a magnetic mine at 0744 on 9 September while passing down the Straits of Malacca. She eventually limped into Singapore at 1200 on 11 September. General Itagaki, accompanied by Vice Admiral Shigeru Fukudome and his aides, were brought aboard HMS Sussex in Keppel Harbour to discuss the surrender. They were received by Lieutenant-General Sir Philip Christison and Major-General Robert Mansergh. A tense encounter began when a Japanese officer reportedly remarked, "You are two hours late," only to be met with the reply, "We don't keep Tokyo time here." By 1800, the Japanese had surrendered their forces on the island. 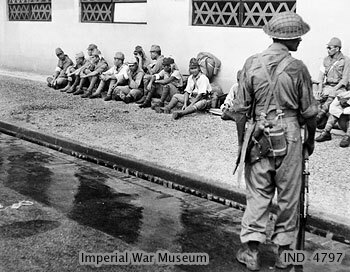 An estimated 77,000 Japanese troops from Singapore were captured, plus another 26,000 from Malaya. The formal surrender was finalized on 12 September at City Hall. Lord Louis Mountbatten, Supreme Allied Commander of Southeast Asia Command, came to Singapore to receive the formal surrender of Japanese forces in South East Asia from General Itagaki Seishiro on behalf of Field Marshal Hisaichi Terauchi, commander of the Japanese Southern Army Group who had suffered a stroke earlier in the year. A British Military Administration was formed to govern the island until March 1946. Itagaki departed for Japan shortly afterwards to face his trial and execution as a war criminal. 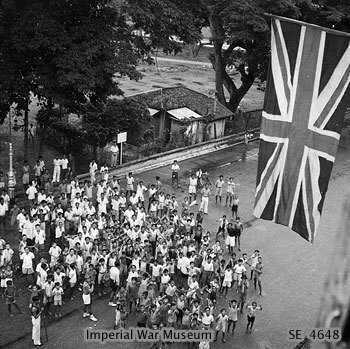 This, the darkest period in Singapore 's history, only ended when the Japanese surrendered to the British on the 12 th of September 1945. 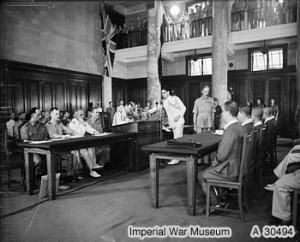 On this day, Lord Louis Mountbatten watched General Itagaki Seishiro sign the formal surrender. 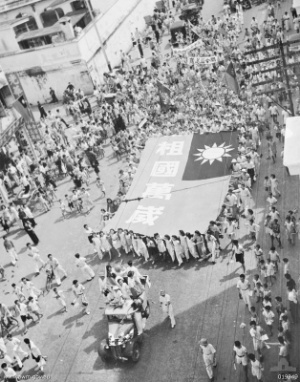 The Japanese Occupation had lasted three and a half long years.